Love! Love! Love! Sophie is a university professor whose life gets thrown upside down after the death of her father, even more concerning are the voicemails from her father right before his death. . Sophie doesn't know who to trust but ends up finding Damon to help her. This is a thriller story with a bit of romance but all amazing. I cannot wait for the next books in the trilogy, we are all incredibly lucky to get two more novels in this series. I wasn't able to put this page turner down and neither will you! I loved this book! Sophie is someone I really related to, and I was really rooting for her and Damon! A very fast paced and interesting book - totally worth a second read! I was pulled into the story from the first page. It is an intriguing, suspenseful, romantic mystery that kept me turning the page. It is fast paced, yet the characters and story are well developed. Damon and Sophie are both strong individuals, who only make each other better. Can't wait to learn more about the other characters in the upcoming books. Great start to this series. Perilous Trust was my first introduction to NYT Bestselling Author Barbara Freethy, and it didn't disappoint. It's a tightly written, well-structured, suspenseful second-chance romance, with well-developed characters, an undercurrent of sadness with a touch of regret, and intense sexual chemistry. It hooked me from the climactic first scene and kept me turning the pages from beginning to end. I read it in less than a day, and the tight pacing had everything to do with that. It was an easy read, suspenseful enough to keep me guessing but not so anxiety-producing that I had to stop to take a breath (or dread turning the page). Both principal characters--Damon Wolfe, an ex-military FBI agent, and Sophie Parker, the daughter of Damon's mentor--are smart, strong, and resourceful, willing to risk everything to expose the mole (or moles) in the FBI that led to her father's tragic death. Their shared history, forged through a common bond with a now-deceased friend, ended too soon, leaving them with some serious unfinished business. Their unanswered questions hang in the air between them, but exploring them is essential to developing the level of intimacy and the trust they will need to survive their race against a ruthless team of unknown assailants. The secondary characters, primarily two trusted FBI colleagues from Damon's days in Quantico, are introduced here to support the discovery of the conspiracy that could bring them all down; but they also pave the way for development as principal characters in future installments of the series. They are nuanced and prime for further development as the series continues. The only drawback for me was the delayed introduction of the primary villain. I found it a bit "too convenient," and consequently, the end came together a bit too quickly (and felt a little too easy). It seems rushed, especially after the build-up of other evidence in the case. And, while the sexual attraction between Damon and Sophie was steamy, when they finally gave into temptation, their sensual encounters felt a little flat for me. Nevertheless, I enjoyed this story and felt deeply for all of its characters. I love crime dramas, so romantic suspense is my favorite go-to genre. I gravitate to darker, breath-taking, heart-pounding romantic thrillers; but to be honest, this well-crafted story was a respite for me. It was suspenseful without being terrifying, which made it a perfect, relatively light weekend read and a perfect start to a series I'm eager to read and certain to enjoy. An outstanding book! I was hooked from the first page. I enjoyed the characters, the intrigue, and the fast pace of the book. The action was constant; many times I wanted to peek at the end of the book. I definitely recommend this book and look forward to reading the next book in the series. This book was a harder one for me to read than most of Barbara's books. I think if you go into this book knowing what to have your expectations at then you should enjoy it. I unfortunately struggled reading this book. I think my biggest problem with this one is it's much more mystery based vs anything else. You will find some romance but it's very little that even with it I consider this to be just mystery. Now, if I read this a few yrs ago I would have instantly loved it. Since I rarely read plain mystery books these days it took effort. I did end up enjoying this book but had to set it aside for a few days and be in the right mindset to enjoy this book. I have loved most of Barbara's other books so I do know my issue with this book is completely on me. I am still looking forward to the other books in this series. I received an Arc in exchange for an honest review. 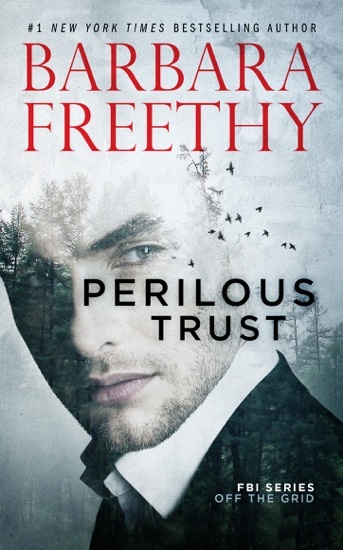 Barbara Freethy just kicked it up a notch with Perilous Trust. The first of a new series, this story revolves around Sophie Parker and Damon Wolfe. Sophie teaches archaeology at NYU and takes students on digs in the summer. Her world is turned upside down when two of her father's FBI friends and co-workers show up one day after class to let her know that her father had been killed. After they leave, Sophie looks at her phone and sees that her father had left several voicemails for her before he died leaving her very cryptic instructions on what to do, but was very clear that she shouldn't trust the police or anyone at the FBI and she needs to get away. Sophie goes to her fathers safe house at the lake following his first clue. Damon had met Sophie four years earlier at the lake house at the wake of their mutual friend Jamie who was killed while on a mission with the FBI. They had one night together, but never saw each other again. On a whim, Damon takes a trip to the lake house upon hearing that Sophie went missing after receiving the message of her father's death. Damon finds Sophie at the lake house. While Sophie isn't sure if she should trust Damon, after being shot at she realizes she's going to need help and decides to take the chance. There are so many twists and turns to this story that you can't put it down once you start! I've always enjoyed the suspense and mystery in Barbara's stories, but this story grabs you from the very first words and keeps you hanging on the edge until the very end! There is an intense underlying chemistry between Sophie and Damon too that they try to fight, but they realize quickly that it's something they can't ignore. What develops between them throughout the story is a love we all hope to find. I would highly recommend this book to anyone! I received an advance copy of this book for an honest review.